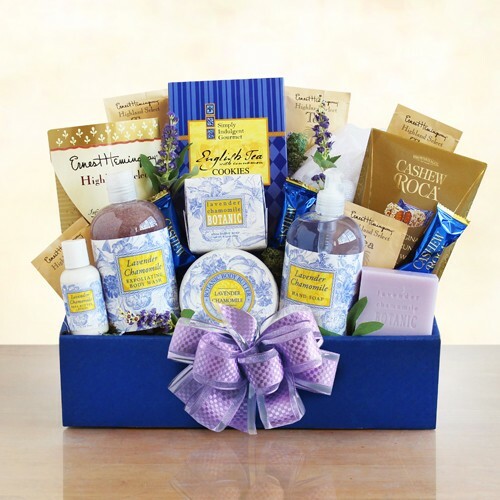 This beautiful cobalt blue gift box from La Bella Baskets holds everything needed to recreate a pampering day at the spa. 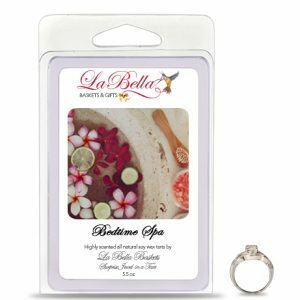 Lavender Chamomile scents that soothe the soul compliment the body lotion, body wash, hand soap, moisturizing bath bar, body butter and sponge. 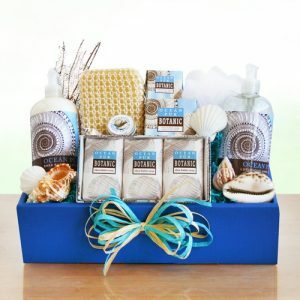 This beautiful cobalt blue gift box from La Bella Baskets holds everything needed to recreate a pampering day at the spa. Lavender Chamomile scents that soothe the soul compliment the body lotion, body wash, hand soap, moisturizing bath bar, body butter and sponge. Also included are Hemingway tea, English tea cookies and cashew Roca. Ahhhhhhhhh!